About 6 years after the biggest Norwegian Black Metal band found out that they are going stale and did a major genre transition from shrieking Satanic hymns to singing cheesy ballads about metal and everything that follows it, comes the biggest and best release since then. The masters of the dark have suddenly become the masters of versatility. The Underground Resistance is clearly a benchmark on the band’s discography, and notably one of the best albums of the year. What can be seen in this particular masterpiece is an amalgamation of Black, Thrash, Death and even instances of Old School and Power. This can be clearly seen in the first song “Dead Early”, which starts off with a slow-chugging riff with is then replaced by a blasting Motorhead-like theme with Nocturno Culto’s raspy vocals coming into full focus. The second song “Valkyrie” starts with a soft chord strumming which goes into full force, with Fenriz doing Power metal-esque chants. The next song, ”Lesser men” has some requisites of the black metal glory that this two piece can create, which sounds a bit like a song off Panzerfaust from their early days. 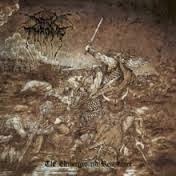 “The Ones You Left Behind” starts with a thrashy riff, which again follows into Fenriz’s chants, which are more falsetto-like at this time. “Come Warfare, The Entire Doom “ start with a slow doom archipeggio which then transforms into that raspy,piercing riff that we all identify to be standard fare black metal. Then the closing song “Leave No Cross Unturned” sees some unique and impressive vocal renditions by Fenriz. The guitar work is slick as always, as expected from Nocturno Culto, but Fenriz also has his shining moments here and there, such as the guitar solo in “Valkyrie”. The drum work is definitely in complete sync with the guitars, although it lacks the speed of the previous black metal albums, such as the infamous black metal trilogy of 1991-1995, but that is obviously not necessary here. In the vocal department, Fenriz has done an impeccable job at clean vocals, which have some amount of crudeness but it only adds to the effect. Nocturno Culto has also proved as to why he is the best rasper in the business, and why for so many years people held Darkthrone as a formidable force in the Black Metal Industry. Overall, The Underground Resistance is a killer album for any metal fan of any subgenre, not only black metal. Darkthrone has managed to do something that many have tried but only few have successfully executed-a mashup of two or more genres which are distances away from the band’s original one, and possible unfamiliar (or downright unlikeable) for the fans themselves.After doing all that, they still sounded amazing and badass as hell.